Upgrade your Neo-Flex Mobile WorkSpace (24-182-055) with added laptop security. 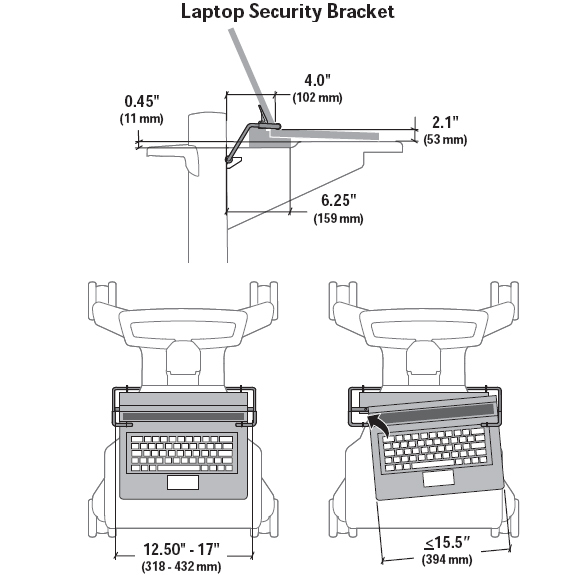 Ergotron 97-465-057 laptop security system offers theft deterrence as well as stability against unintentional bumps - no need for Velcro or adhesives. For use with Neo-Flex Mobile WorkSpace Cart (24-182-055). Durable, easy-to-clean exterior composed of high-grade plastic and powder coated painted steel. Polyurethane end caps and grommet on adjustment bracket help protect laptop surface while eliminating metal to metal contact. Adjustment bracket holder requires drilling six (6) holes; four security screws and two installation screws. Unique security screw and nut-plate assembly of bracket lock allows for one-hand installation. Excessive wear on laptop hinges is prevented by adjustable hinge supports. With most 12" to 17" laptops. Outside width of laptop ≤ 15.5 (394 mm) and height of ≤ 2.1" (53 mm); also accommodates docking stations. Integrated laptop security system offers theft deterrence through unique bracket lock holder. Provides stability against unintentional bumps by fastening brackets to work surface - no need for Velcro or adhesives. Adjusts inwards and outwards to securely hold laptop monitor. Flexible, open-architecture design is ready for the computer equipment of today and tomorrow.